It’s great fun to watch Anselm Kiefer work. It’s also sometimes heart-stopping, as when he patters around in flip-flops while he and assistants smash large panes of glass into piles of shards. Or when, sans goggles, mask, or gloves, he wields a powerful, long-handled blowtorch, melting lead in a cauldron while standing precariously atop the steep slope of a giant pile of dirt. Watching him work is the best part of Over Your Cities Grass Will Grow, a documentary by Sophie Fiennes, who followed Kiefer around his vast art-making complex outside of Barjac, France, shortly before he decamped to Paris in 2008. In fact, the amount of installation-work he was doing at a point apparently close to his departure suggests a whole dimension of performance art designed to be filmed. Kiefer moved to Barjac from Germany in 1993, and made a lot of art—at one point he casually mentions “112 lorries full” of art already trucked away, presumably to galleries, museums and private sales. But, he says in the film, he plans to leave a lot in Barjac, too—some kind of sculpture or painting in every room or house, of which there are many. Some appear to be freestanding sheds, small outbuildings with doors through which you can peer at a painting or installation. Others are bare suggestions of houses: cobbled together from pieces of cast cement in varying sizes, they are stacked one atop the other, so many mad leaning towers across the landscape. Kiefer obviously loves building things—from faux houses to tunnels to caverns excavated around concrete columns pre-constructed by digging round holes in the ground and filling them with concrete and rebar. (Heavy machinery is definitely one of the stars of the film, from the huge rotary drill to the compact, turn-on-a-dime steam shovel.) 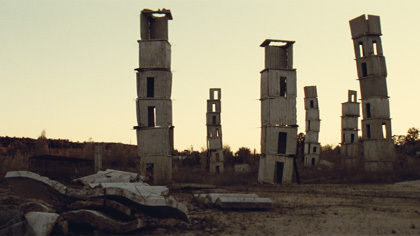 He even constructs rubble, as we see at the end of the film when the camera moves with excruciating slowness around one or more piles of the stuff, all tangled rebar and broken concrete, carefully encased in a large, mostly glass structure, a sort of giant vitrine-in-the-woods. In the meantime, there is the pleasure of watching Kiefer work. One of his signature giant, grayscale paintings of a forest—or, rather, the tree trunks of a forest—lies flat on the floor of his giant “art hall.” Kiefer moves around and on it, scattering a white substance over the surface with a hand-held brush until an assistant brings a long-handled broom. Still, unlike such younger art entrepreneurs as Damien Hirst and Jeff Koons, the artist remains at the center of both creation and production; his hand is, literally, on the work. That molten lead gets poured (by an assistant) down the giant pile of dirt, but it coagulates too fast. Kiefer wants it to run all the way down, to make the sculpture he envisages. He has an idea, takes up the blowtorch again, clambers part way up the dirt pile, directs an assistant to get on the other side, and together they re-melt the coagulated lead so it runs all the way to the bottom. Then, at the foot of the stream of lead, they burn a book (not being implicated in it, Kiefer has never shied from evoking Germany’s Nazi past). A giant lead book. When the book is ashes, Kiefer rakes the ashes around. Giant lead books turn up everywhere. We see piles of them waiting for use, apparently mass-produced, with individual lead pages that can be turned. 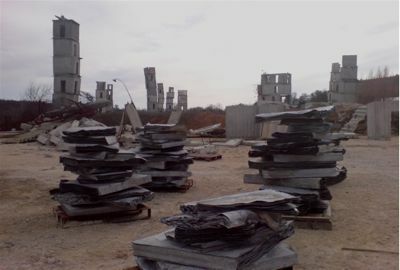 Many of the concrete faux houses squash giant lead books. Or books are draped over their top corners at different levels. A giant lead book is hoisted up in front of a huge painting of the ocean (another signature theme) that has been carried in by the assistants. (”Fetch the sea” brings a laugh in the movie theatre.) The book is too big. A smaller one is produced, hoisted, affixed. The surface of the lead pages is distressed. A large lead boat is hoisted up in front of another sea: the paintings grow more and more like sculpture. They remind me—on a much more massive and somber scale—of the 60’s, when Rauschenburg, Johns and others dangled objects in front of a painted surface or fixed them to it—a fork, a chair, a ruler. Mixed media, in a vastly different frame of mind—colorful, playful, fragile, domestic. Kiefer, born in 1945, just before the end of World War II, has said that as a child he loved playing in the rubble left by the war. (In the Guardian profile, he says he made little houses out of it.) Rubble has a somber tone, as his work does now. The very massiveness of his work here—both wall pieces and installations—seems at once evocation of that time, recreation of a world destroyed, and, since Kiefer intends the Barjac installations to return to nature, ironic confirmation of the fragility of man-made structures. Fiennes clearly worships Kiefer’s work; in the first part of the film, the camera spends entirely too much time moving slowly across rough walls and down long, well-lighted tunnels. We do see some marvelous pieces inside the sheds or free-standing rooms: The camera looks in through one door frame, pans down a display of broken pots and potsherds artfully arranged against a flowing black stain, then backs up until, outside, we see a woodsy fall landscape next to the shed. Also fortunately, Kiefer at work is the bulk of the film, because the camera returns to a tight focus at the end, giving us a letterbox view as it moves slowly down slabs of cement, the edges of giant lead books, those rough dirt walls. I thought of the eye’s ability to take in so much more, and longed for Fiennes to pan away and give us a sense of perspective. Only at the very end does she allow us a satisfying glimpse of the expanse of those leaning towers of faux concrete houses. Released by: Alive Mind Cinema. In French, English and German, with English subtitles. This entry was posted on August 21, 2011 at 6:10 pm and is filed under Art, Culture, Film. You can follow any responses to this entry through the RSS 2.0 feed. You can leave a response, or trackback from your own site. 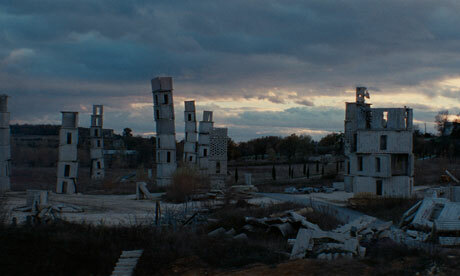 I very much enjoyed your Anselm Kieffer piece with its dedicated descriptions of the work and the process and the film. I can’t remember the last time I read anything about Kieffer, so he has you to thank for this…. Re the music background – I love music and even have been guilty of sometimes treating it like wallpaper while i am concentrating on something else, but it infuriates me that so many documentarians feel they constantly MUST have tinkling pianos or throbbing strings which may or may not be appropriate for what is going on before our eyes. Ken Burns is my main bete noire, he abhors a sound vacuum and I have tried muting the sound track in hopes of a closed captioning alternative. Thanks for sharing your ideas. I’d personally also like to mention that video games have been ever before evolving. Modern tools and revolutions have made it easier to create sensible and interactive games. These entertainment games were not as sensible when the real concept was being used. Just like other forms of know-how, video games also have had to advance via many ages. This is testimony on the fast progression of video games. as here every information is quality based stuff. Hey all. That is certainly an incredibly well written content. I will be certain to save this and am available to discover more of your information. I’m surely going to return.